This article gives an introduction to using custom JMX MBeans within Grails. JMX (Java Management eXtension) was an early JSR specification (JSR-3) and the first final release was in 2000 with subsequent maintenance releases in 2002 & 2006. Additional capabilities such as remoting support (JMX-RMI) were added through subsequent JSRs. The JMX spec in essence allows you to check values of attributes on an MBean (Management Bean), set attribute values, invoke methods (e.g. shutdown) and it also caters for notifications. For this article we’ll focus on the first of those. In my experience not many Java application developers are familiar with JMX though I’ve seen (and encouraged) more usage of custom MBeans on Spring powered applications. The Spring framework makes it exceptionally easy to export a bean as an MBean and to register it with an MBeanServer. * Simple JMX MBean example. I’ve created this in src/groovy/com/rbramley/jmx/SimpleMBean.groovy (so obviously it has “package com.rbramley.jmx” at the top). Having set up a bean, we need an MBean Server so that we can register our MBean. Luckily the Spring Framework helps us out here. The MBeanServerFactoryBean will attempt to locate an existing MBean Server (this behaviour can be turned off). Now we’ve exposed some information via JMX, how can we access it? First up is jconsole, this tool has been shipped with the Sun JDK for a while now. It can access local apps by process ID and remote applications by URL. 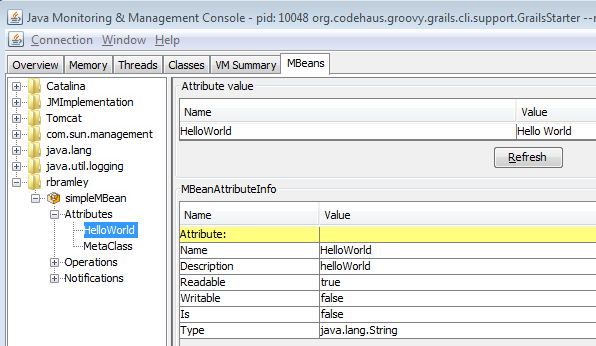 Here I’ve accessed the grails local process, selected the ‘MBeans’ tab and navigated to the ‘helloWorld’ attribute. Notice how the MBean is in the ‘rbramley’ namespace – this was achieved with the map key in the ‘beans’ property of the mbeanExporter bean. If you’re using Tomcat, the manager application provides a JMX proxy servlet – see the manager docs for more details. We can also access JMX from Nagios-based monitoring systems such as Opsview using check_jmx – but more on that later on in the series when we pull it all together.